The sun came out for the Good Friday in London. I’m loving this still chilly yet full of Spring optimism weather. So, this post is definitely not reflecting my positive feeling at the moment, but this reminds me where I was 12 months ago and how far I’ve come as a person. In a way, it makes sense to post this and appreciate new starts in life because it’s Easter. 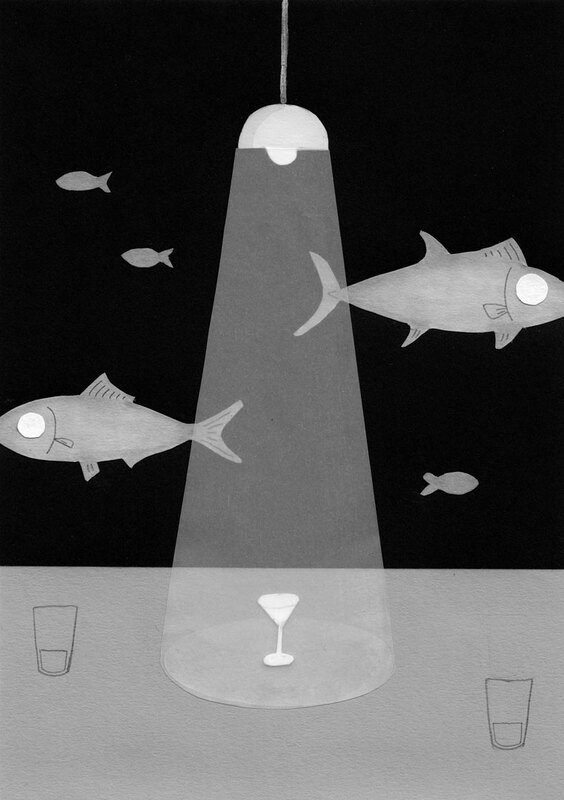 This is a short story I wrote and this is the story behind the illustrations – Bait and The Sea, in my zine Emma. Emma knows there are plenty of fish in the sea for her, but she does not fish, at least not by aggressive angling methods with a rod. Actively casting a decorative fly and manipulating it to make luring movements to catch the prey is not her forte. She is too self-conscious for those sort of tactics. Instead, she lays a trap gently and quietly on the bottom of the sea and waits. She occasionally forces herself to go to social events and cultural workshops, where the possibility of meeting her kind of fish is at least not impossible, if not likely. However, all she does is wait ­- wait for someone to notice her and take an interest. Emma indeed is a good bait. She is attractive in a simple way. “Handsome” is the best word to describe her oval face with high cheekbones and small yet bright eyes. She also has an exotic quality that you cannot instantly pinpoint her origin. She is neither awkwardly short nor offensively tall. Her body is slim but still has feminine definitions around her waist and hips. As well as her lean legs, she also has defined décolletage, which she shyly hides under her long black hair. However, because she hides all of these positive assets under the garments of her stubborn insecurity, her fishing is usually a marathon, rather than a sprint, which requires plenty of patience and a good amount of luck if not a miracle. In the next post, I’ll share the story behind the illustration Crack.